Registration is done, teams have been chosen, assigned and sorted and now we anxiously await the beginning to the season. In Edmonton the Martin Yonge Ice Breaker Tournament is April 8-10. Regular league play begins April 14 for Adult leagues and April 18th for Youth Leagues. In Grande Prairie Adult registration wraps on April 2nd at Dave Barr arena, and Youth final registration day will be April 9th again at Dave Barr arena. They will be starting their regular season around the end of April. Mountain View has wrapped up their registration and their season will be begin on April 8 as they participate in the Martin Yonge Ice Breaker. Calgary roller hockey has closed their registration, although they still have space for a few individual players. If you are interested in joining Calgary Roller hockey contact Nick at calgaryrollerhockey@telus.net The CRHL season begins on April 11. Wetaskiwin Jr. Ice will start their program April 18th, and are sending teams to the Martin Yonge Ice Breaker again this year. AMRHA and Wetaskiwin are currently working on a local drop in program, stay tuned for more information on that. Lethbridge’s season begins April 25th, additionally Lethbridge is hosting a Youth learn to play clinic May 7th at the Henderson Park Arena. Registrations for that are being accepted online. 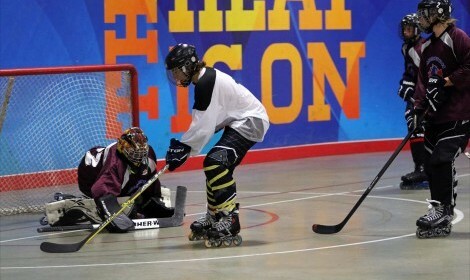 Red Deer Roller Hockey’s House League play will begin on April 11th. All in all it is shaping up to be an exciting year!